We are located at Interstate 30 and Hwy 183 South ( Alta Mere) just across the freeway from Ridgmar Mall and directly behind Thornhill Nissan auto dealership. 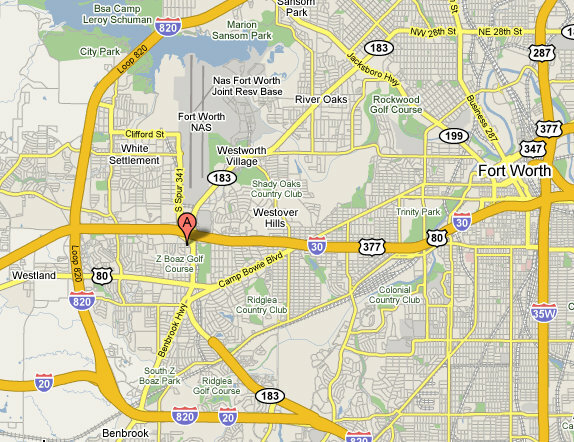 Traveling on I-30 take exit 7B and follow 183 South. Turn right at the first signal light you come to which is Calmont Ave. We are located 1/2 block down on the left side of Calmont. Traveling on I-20 West, exit 183 West (Southwest Blvd) to the traffic circle continuing on 183 West past Camp Bowie until arriving at the next light which is Calmont Ave. Turn left onto Calmont and the rink is located 1/2 block down on the left side of Calmont directly behind the Nissan auto dealership.